Gray hair is a common sign of getting older. Even with that, scientists aren’t really sure why hair goes gray. But one thing that is known, is that men have many options for coloring their gray hair or embracing a little bit of gray with style. Hair obtains its color not from the hair shaft, but from pigments made by cells in the hair follicle, known as melanocytes. There are two basic types of pigments — dark and light. These combine in different amounts to create the wide range of hair colors that we see in people. Without those pigments, hair would be white. As people age, the number of melanocytes decreases, which means there is less pigment being made. Unstable oxygen molecules may play a part in this. These molecules have been linked to other aspects of aging. When pigment-producing cells are exposed to these molecules — a process called oxidation — the cells die. For men, coloring gray hair is not just about covering up the gray. You want your hair to look as natural as possible, as if the hair had grown out of your own head. For the best results, a professional coloring is the way to go, because a hair expert can look at your hair and decide which way to approach your gray hair. They can also choose a color that best matches your complexion and pre-gray hair color. Plus, at-home coloring kits may leave your hair with a reddish-orange tint. Men with just a small amount of gray should spot treat it rather than color the whole head. You can apply temporary color with a touch-up pen to such small areas as your sideburns. This will wash out when you shampoo. 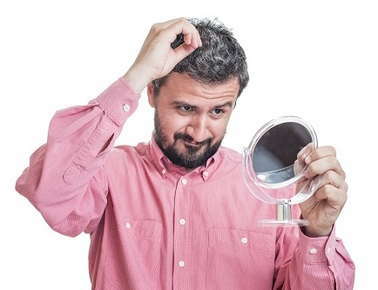 Some hair experts don’t recommend plucking those few offending gray hairs, because this can damage the hair follicle. To avoid looking like you just added shoe polish to all of your hair, don’t opt for 100 percent coverage. A professional hair stylist can give you a gray-blended look by using very low amounts of peroxide in the coloring. This will look more natural when your hair grows out. A semi-permanent color rinse is also a good option for men. This color will fade gradually over several weeks, so you aren’t left with a sharp color line. And if you decide that you want to embrace your gray, you can just let the dye wash out completely. To keep your gray roots from showing, have your hair colored as often as you get your hair cut. And use only color-safe shampoos. These will help keep the color longer and prevent your hair from turning red. No coloring is permanent, though. You will need to reapply the color when the gray starts to show again, around every four weeks. Another option for men is to style the hair so the shades of gray look good. A short cut will eliminate the wiry and coarse ends of gray hairs. It will also emphasize the shades of salt and pepper. A gray hair shampoo can also tone down the yellow colors in your gray hair, leaving you with a stronger silver or white look, perfect for that more salt than pepper look. If you have a beard that’s graying, a hair professional can color that, too. It’s best to match the color to your head. However, you may have to color your beard every two or three days. This is one time when an at-home kit will work well. Ask your hair stylist for suggestions. Even if you only have a few gray hairs, it is never too early to talk to your hair stylist about your options for coloring your hair. The best option for your hair may change over time, and it may also involve finding a hair style that looks good with a little bit of gray.